Alluvial Soil | Definition, Formation & Characteristics. › Alluvial soil is formed by accumulated sediments transferred by the rivers and rapids, thus, it is amongst the most fertile soils. It is a fine-grained fertile soil deposited in river beds or by water flowing over floodplains. › Alluvial soils are formed mainly due to silt deposited by Indo-Gangetic-Brahmaputra rivers. › The alluvial soil is spread all over the plains of north India. They are also found in the four delta regions of the south. Strips of alluvium occur along rivers in the plateau as well as in the mountains. › In coastal regions, some alluvial deposits are formed due to wave action. › Rocks of the Himalayas form the parent material. Thus the parent material of these soils is of transported origin. › Alluvial soil is amongst the most fertile soils. It is fine-grained fertile soil deposited in river beds or by water flowing over floodplains. They lack humus and nitrogen. › They are the largest soil group covering about 15 lakh sq km or about 6 percent of the total area. › They support more than 40% of India’s population by providing the most productive agricultural lands. Alluvial Soil is formed by the deposition brought by the rivers. This soil is very fertile and suitable for agriculture. It covers about forty percent of India’s total land area. What are the main features of alluvial soil? › Alluvial soil is considered the most fertile soil. 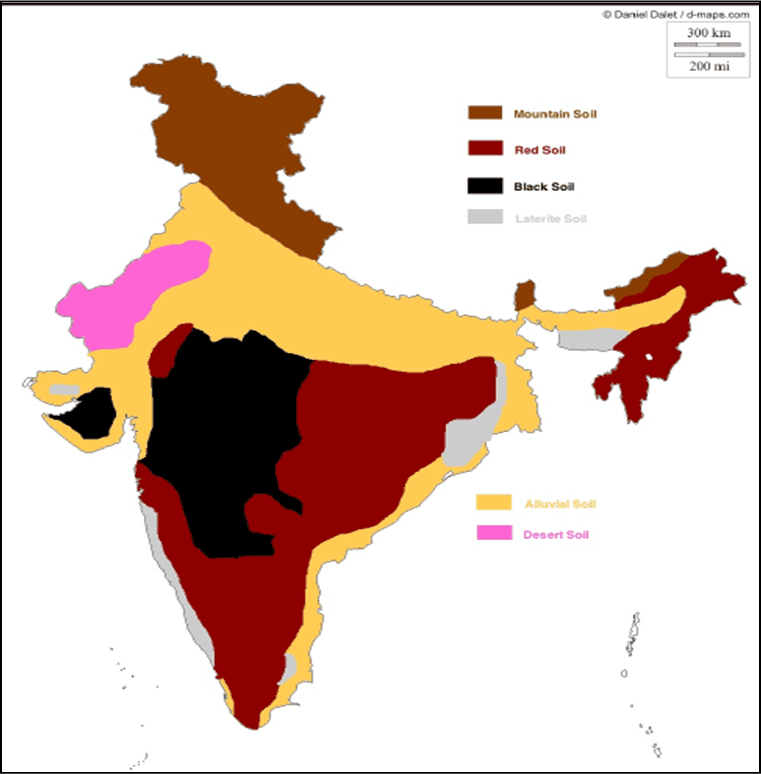 › The entire northern plains of India are made of alluvial soil. › Alluvial soil contains an ample amount of potash, phosphoric acid and lime but is deficient in Nitrogen and humus. › They are immature and have weak profiles due to their recent origin. › Most of the soil is Sandy and clayey soils are not uncommon. › These soils are formed when streams and rivers slow their velocity. › Pebbly and gravelly soils are rare. Kankar (calcareous concretions) beds are present in some regions along the river terraces. › The soil is porous because of its loamy (equal proportion of sand and clay) nature. › Porosity and texture provide good drainage and other conditions favourable for agriculture. › These soils are constantly replenished by the recurrent floods. › The proportion of nitrogen is generally low. › The proportion of Iron oxide and lime vary within a wide range. › They occur all along the Indo-Gangetic-Brahmaputra plains except in few places where the top layer is covered by desert sand. › Some alluvial soils are found in the Narmada, Tapi valleys and Northern parts of Gujarat. What types of crops are grown in alluvial soil? › They are mostly flat and regular soils and are best suited for agriculture. › They are best suited to irrigation and respond well to a canal and well/tube-well irrigation. › They yield splendid crops of rice, wheat, sugarcane, tobacco, cotton, jute, maize, oilseeds, vegetables and fruits. › Two types of alluvium are generally found throughout the Indo-Gangetic plain, namely Khadar, consistent in texture and rather fertile, and Bhangar, which consists of alkaline. › Bangar/Bhangar (बांगर) is not to be confused with sandy arid Bagar region which is also mainly not prone to the flood, but regions outside of Bagar region may have both Khadar and Bangar areas within the same village (see Doab for better clarity). Bangar area is less prone to flooding but is usually sandier and less fertile as well. › The Bhangar is the older alluvium along the river beds forming terraces higher than the floodplain (about 30 metres above the flood level). › It is of a more clayey composition and is generally dark coloured. › A few metres below the terrace of the bhangar are beds of lime nodules known as “Kankar”. › Khadir or Khadar (खादर) plains are those floodplains that are low-lying next to a river. › Khadar areas are prone to flooding and sometimes include portions of former river-beds that became available for agriculture when a river changed course. › It is moisture retentive and sticky when wet Khadirsoil consists of new alluvial soil deposits and is often very fertile. › Bangar plains are more upland, and consist of older alluvial soil. › They are sandy clays and loams, more dry and leached, less calcareous and carbonaceous (less kankary). › Sri Sri Ravi's Art of Living Foundation World Culture Festival, 2016 (11 March) was held on Yamuna's Khadir floodplains and National Green Tribunal (NGT) recommended a fine of INR 50 million, on Art of Living Foundation for damaging ecology on Yamuna's Khadar flood plains. Mostly available soil in India (about 43%) which covers an area of 143 sq.km. Humus, lime and organic matters are present. Indus-Ganga-Brahmaputhra plain, Narmada-Tapi plain etc are examples. They are depositional soil – transported and deposited by rivers, streams etc. Wheat, rice, maize, sugarcane, pulses, oilseed etc are cultivated mainly. The crops that can be grown in alluvial soils include wheat, rice, barley, maize,bajra, jowar, pea, pigeon pea, chickpea, black gram, green gram, soybean, groundnut, mustard, linseed, sesame, sugarcane, jute, cotton and tobacco. What is alluvial soil and where is it found? Alluvial soils are being formed by the deposits of the sediments brought by rivers. Found in Uttaranchal, U.P., Bihar, W. Bengal, Punjab, Haryana & Assam. In south, found in the plains and deltas in Andhra Pradesh, Orissa, Tamil Nadu. How is alluvial soil is formed? If the water velocity decreases, finer particles (sand and silt) are deposited, while fine silt and clay particles are deposited by slow-moving water such as that found associated with deltas. Alluvial type of parent material is associated with such landforms as old streambeds, floodplains, deltas, fans, and levees. What is the definition of alluvial soil? Alluvial soils are soils deposited by running water and are often located in existing floodplains. What is alluvial soil made of? Alluvium, the material deposited by rivers, consists of silt, sand, clay, and gravel and often contains a good deal of organic matter. It, therefore, yields very fertile soils such as those of the deltas of the Mississippi, the Nile, the Ganges and Brahmaputra, and the Huang rivers. Is alluvial soil rich in humus?